Teamviewer is arguably the most popular and easy-to-use remote access service out there, quickly becoming a household name. After coming out for Windows, Mac OS and Linux, the service has just been rolled out for Android devices. Since I tend to help friends and families with their computer problems remotely, the program has been essential for my work. TeamViewer Free is supposed to streamline the whole ordeal even more. If you’re wondering what TeamViewer Free is actually about, here’s a great personal example for you to give you an idea of how the software works. I’m sure you’re are familiar with this phenomenon of the one guy in the family that “knows stuff about computers” and is forced to help all his computer-illiterate family members figure out how to manage their PCs and Macs. The thing is that, well, I am exactly that guy, the one that spends his weekends helping out grandma use video chat via Skype. Trying to help your relatives with their computer problems over the phone can cost you your sanity and, to be quite honest, it rarely actually helps. That’s why a couple of months ago I installed Teamviewer on my grandpa’s laptop. Now whenever I get a call with a technical question, I can just start up the Teamviewer App and view my grandpa’s screen and resolve any issue within minutes. About the app itself: After start-up the app displays three different infoslides, showing you what the app is good for and what it can do. 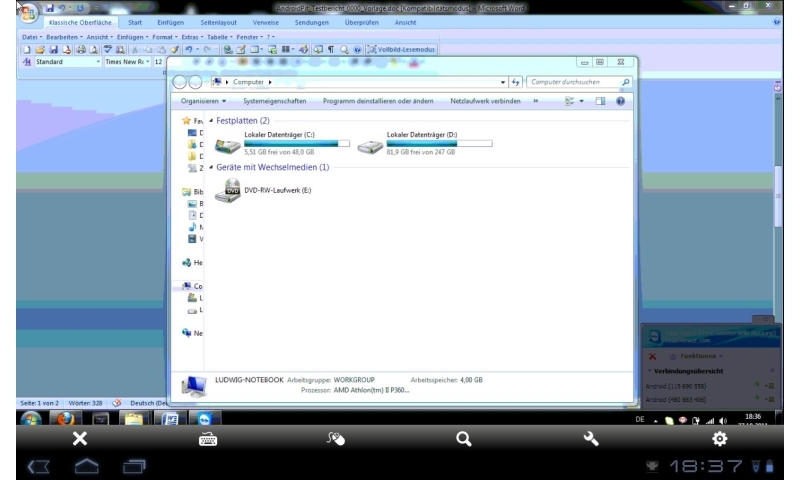 In the Connection tab you’ll find the main feature of the app which is the TeamViewer ID and password. You also have the option of trying a test connection in order to catch a glipse of how the app is in action. After the app connects with a client, you’ll see a couple of tips and trick on how to control the app. After closing up that window, you can finally get started with remote controlling another computer. Alright, so let’s take a look at the controls now, shall we? You would think that any touchscreen these days would be controlled by tapping and swiping, right? Wrong! The entire thing is controlled with the help of a mouse that you can drag across the screen. Tapping the screen is akin to left-clicking something on a regular computer. There’s also the History tab, which shows your previous remote connections. You’ll find all of your TeamViewer IDs displayed here in one convenient location. The third tab includes the Partner list, which is a list of all your remote contacts. In the fourth and last Tab, you’ll find the Options where you can define the picture quality, background wallpaper, remember passwords, get help and revist the how-to guide. Bottom Line: TeamViewer Free is on par with the desktop version and looks awesome. Connecting to other clients is a breeze. All in all, the app deserves a rating of “very good”! Highly recommended, brothers and sisters! Using the TeamViewer Free app is simple and self-explanatory with a simple yet slightly fancy trademark TeamViewer design. As I’ve already mentioned, the app uses an onscreen mouse instead of the regular swiping and tapping techniques. It does, however takes a bit of getting used to and it’s not exactly the most efficient way to use a touchscreen. Every once in a while, you end up clicking on the wrong thing because the mouse isn’t lined up just exactly right. Absolutely no reliability issues with TeamViewer Free. None whatsoever. The connection speed is just fine, but it could also be a tad snappier because speed is where it’s at. TeamViewer Free is available for free from the AndroidPIT Market. And did I mention that it comes with zero ads? Coolness! I personally haven't given it a try, but it looks solid. What's your take on it? How do you like it?